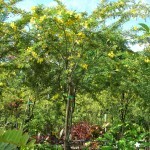 Desert Cassia (Senna polyphylla) - Richard Lyons Nursery, Inc. If the Desert Cassia could talk, it would almost certainly wail, “Woe is me!” And who could blame it? After all, botanists have been tinkering with its name seemingly for years. It was moved from the genus Senna to the genus Cassia, then back to Senna. Despite the turmoil, however, Senna polyphylla has continued to be a dependable and popular element of the landscape of southern Florida. The common name Desert Cassia is actually doubly wrong. 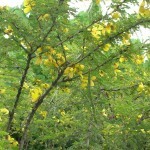 Not only is it not a Cassia, but it isn’t native to any desert. S. polyphylla occurs naturally in both dry and moist forests of Puerto Rico and the Virgin Islands, where average annual rainfall ranges from 30 to 47 in. One of the features accounting for its strong following in southern Florida is its undemanding nature. It is perfectly at home in rocky soils so long as they drain well. It is also virtually free of pests. Its other strong suit is its small growth habit. S. polyphylla generally matures in the 7-11 ft. range, although it sometimes reaches 15 ft. Its thin branches have a weeping or cascading habit, and the bark is grooved or furrowed. 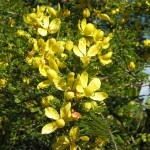 Desert Cassia produces yellow flowers about an inch in diameter. Heaviest flowering occurs during the period from October to May, but blossoms may also pop open at other times of the year. A sunny exposure yields the most prolific flowering. Since S. polyphylla is found natively at elevations from near sea level to nearly 1,000 ft., it is capable of withstanding a bit more cold than other Sennas. It is a host plant for the Sulphur Butterfly, and a nectar source for all of our butterflies. S. polyphylla is available at Richard Lyons’ Nursery in several sizes.